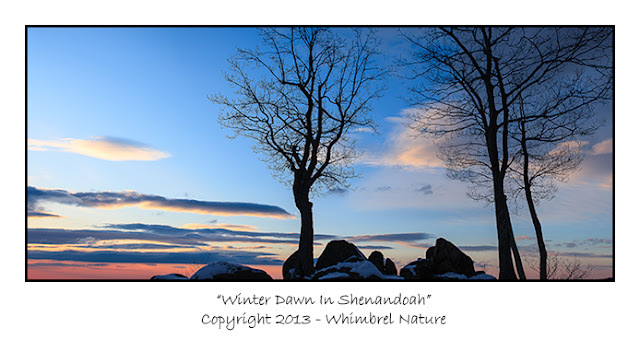 Last week I had the opportunity to get up Shenandoah National Park and Skyline Drive. Though the early spring wildflowers were starting to make their appearance in the lowlands, it was very much still winter up on the ridge tops. In fact there were flurries and periodic snow squalls almost the entire time I was in the mountains. There was still ~5 inches of snow on the ground and a brisk wind was still causing drifting in the passes. Not having much of a winter to speak of down in the DC area, it was nice to get a true taste of winter, despite the cold. I had an enjoyable, if not overly productive, half-day photographing some of my favorite spots south of the Thornton Gap entrance. 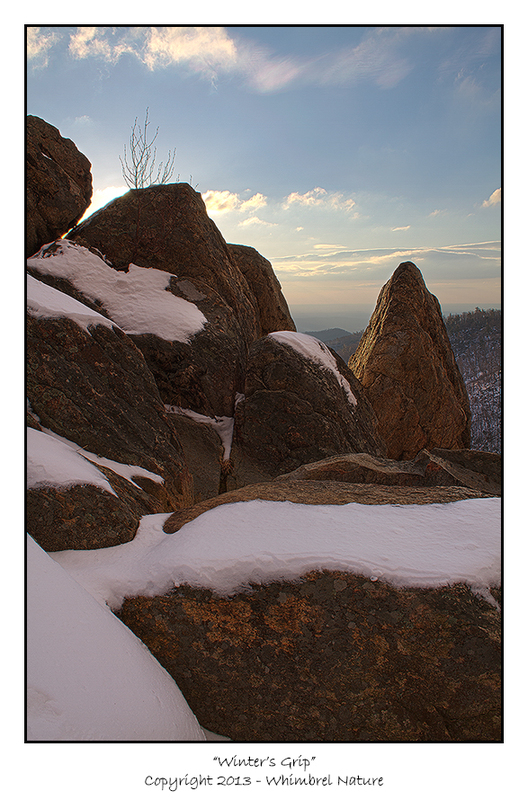 These two images were taken early in the morning from the Hazel Mountain Overlook, just off of Skyline Drive. Both images utilize Photoshop (and field capture) skills that I think are crucial for the modern nature photographer. The first image is a panoramic image stitched together from six overlapping vertical images. This gives me the equivalent of a 57.9 megapixel image that can be easily enlarged to 1.5' x 3' print or even larger. Shooting for a panorama in the field gave me more options compositionally and more options for satisfying clients looking for big prints. I talk more about the benefits of stitching in my post "Going Big" and I'll be posting a video tutorial in the near future outlining the techniques to use in the field and during processing. The second image (also taken at the Hazel Mountain Overlook after sunrise) utilizes the HDR capability of recent versions of Photoshop. In the field I exposed three otherwise identical images at 1 stop apart. I blended them using Photoshop's HDR capability and the result was very flat and gray, but through judicious use of curves, levels, and burning and dodging, I was able to bring back the contrast in the scene that my eyes registered (and to some extent my camera in the individual exposures). I also post some video tutorials on this technique in the near future. Next post will likely be about spring wildflowers. If you live at low elevation in the mid-Atlantic or high elevation further south, now is the time to get out to the woods and look for those early spring wildflowers. Around my area, Virginia bluebells, spring beauty, trout lilies, bloodroot, Dutchman's Breeches, cut-leaved toothwort, and toadshade are all either blooming or just about to. Get out and enjoy! Thanks for sharing these images Elijah, they are beautiful!